Christmas, for many children, is the most exciting time of the year. So exciting, in fact, that it’s hard to get them to sit still for five minutes! As enjoyable as it is to see them so excitable, sometimes you do need a bit of peace and quiet for a little while. So why not get them doing something productive - and fun too? Kids love Christmas crafts. 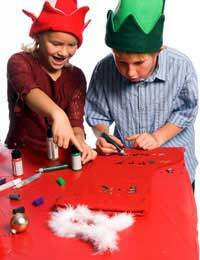 Not only do crafts keep them entertained on the run up to the most exciting day of the year but they give them the chance to make something useful for Christmas that they can feel proud of. There are lots of ideas out there and you can also use your own imagination to come up with some festive projects that the kids can enjoy. But just to get you started here are a few ideas to try out. Angels for the top of the Christmas tree make great craft project for kids. They’re easy to make and your little one gets the pleasure of seeing their own handy work in pride of place on top of the tree or stuck on a window. Cover the toilet roll cylinder in glue. Empty the glitter into a tray, roll the toilet roll cylinder in the glitter then leave to dry. While the glitter is drying, draw wing shapes onto the white card. Carefully cut out the shapes. Draw stripes on the cylinder with the glue stick then sprinkle with glitter and shake the remains into the tray. With the remaining card cut out a circle for the face, leaving a square tab on the end. Using the felt tips draw a face on the circle. With the glue stick apply some glue to the tab and secure to the inner rim of the cylinder so the face is facing forwards. Secure the wings to the back of the cylinder with glue. When everything is dry place on top of the Christmas tree or anywhere else you fancy, for all to see! Every child should have a Christmas stocking hanging on the fireplace on Christmas Eve. This way they get to create their own designs. This is an easy one! Simply let your little ones design their own patterns. They could cut out the letters of their name with the card and personalise their stockings or use the cotton wool balls to add some snowballs or snowmen. Girls will love a glittery stocking while little boys may want to add pictures of the gifts they’ve asked for from Santa! What is Christmas without snow? It seems everyone is dreaming of a white Christmas! But even if we don’t get one this year you can still have some beautiful snowflakes at home! Make a cross with two of the pipe cleaners and fold one end to the other then take the other one back over to the other side securing the cross. Do the same thing with the two remaining pipe cleaners making a star shape. Add silver beads to the ends of each of the pipe cleaners. Tie a string to the end of one pipe cleaner so it can be hung up. Tip: You can get "invisible" thread from most haberdashery stores. It's great for hanging decorations as you can't see it easily.